We’re infatuated with the trend of embroidered denim and this smashing jacket illustrates why. Note the floral design on the shoulder, on the pocket, and on the cuff. Wear it over a soft gray tee, pair it with turquoise jewelry and add a jaunty bag in a southwestern pattern. 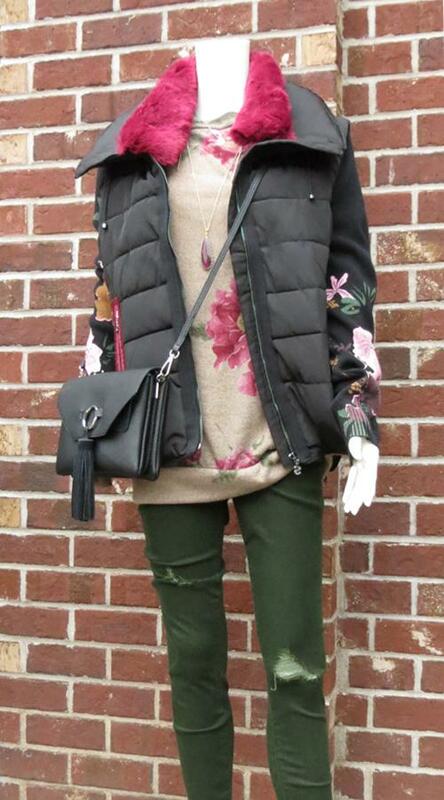 The surprising pops of color make this look compelling for autumn: notice the deep pink faux fur collar and worn army green denim. 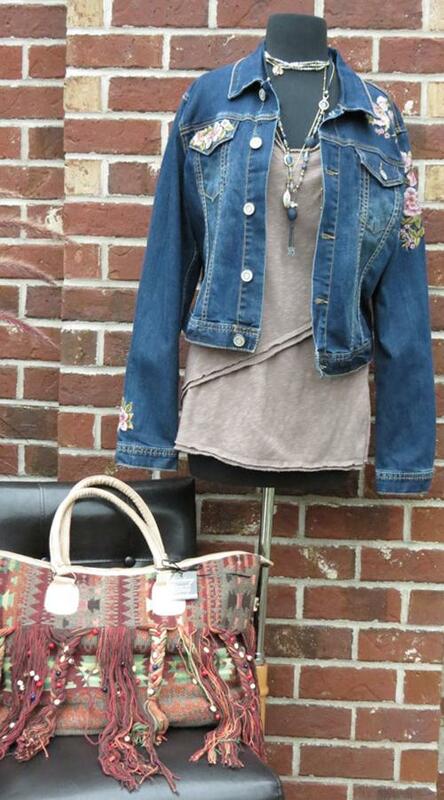 The floral sweatshirt and black crossbody bag trimmed in fringe are striking details as well. 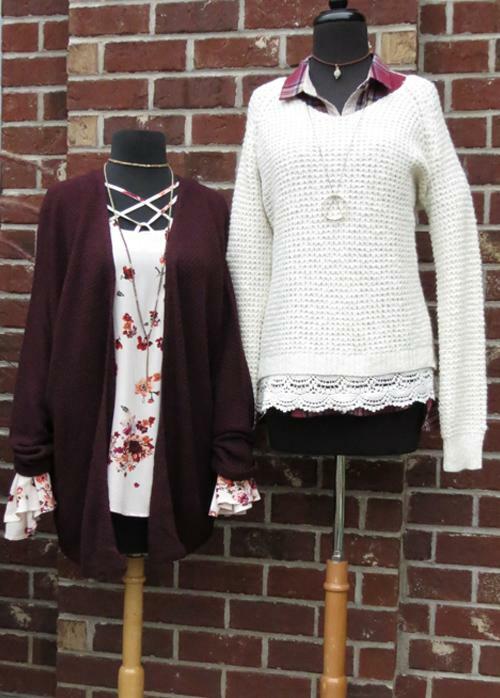 Layering adds interest. Here, floral flounced cuffs peek out under a wine-colored cardigan. Or, start with a plaid button-up with a lace collar and pull a creamy honeycomb-stitched sweater over it. Layering is not just for fabrics; notice how necklaces with varying lengths can be worn together. Don’t forget the footwear. Fall isn’t just for boots (although we have some fabulous ones in store right now too). Check out these cute slip-ons. You simply must try a pair and experience their incredible cushion. You’ll feel light on your feet! 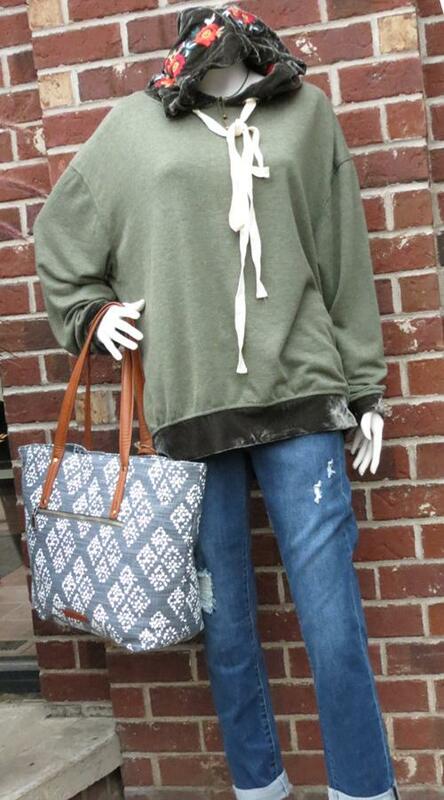 Cuddle up in this casual oversized hoodie with soft velvety accents. Shown in olive, we also have it in other colors. The embroidered flowers on the hood will make this one of your go-to pieces this fall. It pairs well with comfy denim and an oversized bag.